I have a theory that goes like this: “if enough people need to do something, it must be (reasonably) easy to do it”. I was relying on this when we planned to cross the border from Zimbabwe to Botswana. After all, not only tourists need to go from one country to another, regular local people do too. The theory goes on to say, “ask enough people and somebody must be able to tell you how to do this thing you want to do”. We had stayed a night in Victoria Falls in Zimbabwe after a few days of safari down at the Hwange National Park. Now the simple plan was to cross over to Kasane on the edge of the Chobe National Park in Botswana, a short distance away in the grand scheme of Africa. And a popular tourist route, not a backwater border in the middle of nowhere. So it must be (reasonably) easy to do, right? The standard encyclopedia of border crossings, the Lonely Planet guidebook, didn’t offer much help on logistics. As I flicked back and forth between the Zimbabwe and Botswana chapters I could see how things work on on the far side of the border perfectly, but for the Zimbabwe side the information was extremely vague. Actually getting to the border, not crossing it, was going to be a challenge. So we asked our friendly hotel front desk man for information. Could we get a local bus? “No”, he told us, we’d need to take a taxi to “the spot”. After further questioning we discovered this was a dropping-off place for a hiking trail, where apparently we’d find shared cars that would drive to the border. So we jumped in a taxi (haggling a little over price) and drove to this hiking spot, which the driver found had moved up the road so that it could be the far side of a police roadblock (thereby avoiding awkward questions about transport licences for the shared cars). Our hotel information told us that a car should cost $7 USD each to the border. We negotiated through the taxi window for a while and got the price for the pair of us down to $25 total to leave immediately rather than waiting to fill the car with passengers. So we switched cars and waited. 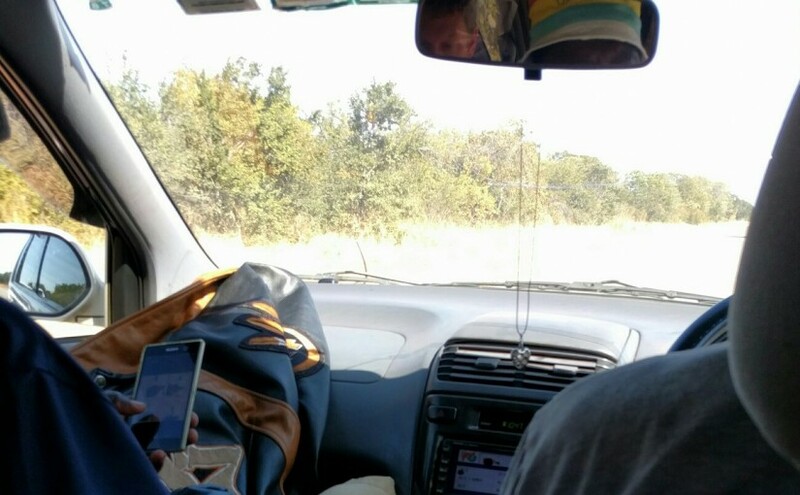 The driver sent a runner to get him petrol, explaining that we wouldn’t want to be driving on fumes, as we had 70km of road ahead of us surrounded by bush and nothing else. We agreed that having petrol was a good idea and waited. A few minutes later another man appeared at “the spot”, and became a fellow passenger. Lots of mock indignation from us led to a renegotiation of the deal with the driver bringing our price down a little. Eventually another car arrived with the runner carrying a couple of large Coke bottles full of petrol and another cut down bottle with a tube to act as a funnel. Safely refuelled we sedately drove to the border, dodging an elephant and some warthogs on the road along the way, reggae pumping from the car’s sound system. Exit immigration at Zimbabwe was laid back and friendly, just like all of our interactions with Zimbabweans over the past couple of weeks. Another stamp on the passport finally invalidated the double-entry visa we’d received at our first border crossing, and a paper ticket allowed us to walk to the border guards and exit the country. The trek across No Man’s Land was short, and we walked up to a Botswana hut where a friendly woman ‘screened’ us for illegal meat with a quick question and another form filled in. She guided us to another hut for immigration (a few simple questions, a free stamp in the passport and another paper ticket). Finally, a guard directed us to walk across a disinfectant pad and to take our shoes from our backpacks and slap them down on the pad too, ensuring they were foot-and-mouth disease free. Walking through a final gate, we were completely in Botswana. We stood under a tree a little surprised that there was no transport to the nearest town or our eventual destination, a camping lodge about 10km away. The Lonely Planet seemed to have failed us. We loitered for a while until one of the shoe disinfectant guards wandered out to ask where we were going. Just a few minutes later a taxi appeared. Probably a friend of a friend had been called, saving us a long wait. Four dollars got us to our lodge, proving that crossing this popular tourist border like a local was possible. Enough people need to cross the Zimbabwe / Botswana border without paying tourist prices. My theory holds that it is reasonably easy, if you ask enough people. And remember that this is Africa and there is always somebody willing to provide an obscure service for a small fee if you are willing to haggle, and wait. Have you got a travel ‘theory’ that works for you? Leave a comment so we can test it out.